У Northrop JB-1 “Bat” was a United States surface-to-surface cruise missile that was a prototype jet-powered flying wing. The United States Army Air Forces MX-543 program was initiated in September 1942 to use license-built versions of Frank Whittle’s jet engine (General Electric J31). The Northrop Corporation was contracted in late 1943, and only 10 JB-1 airframes were built. 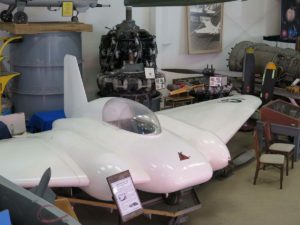 A manned version was towed for the 1st flight on “August 27, 1943”, from Rogers Dry Lake and a glider version was launched from a rocket-propelled sled and crashed in December 1944. An unmanned JB-1 powered by an improvised General Electric B-1 turbojet with a wing span of 28 feet 4 inches (8.64 m) made its 1st flight from Eglin Field’s Santa Rosa Island, Florida, on December 7, 1944, and crashed 400 yards from the rail launcher. The Northrop JB-1 "Bat" was a United States surface-to-surface cruise missile that was a prototype jet-powered flying wing прочитајте више "
Нортхроп Ф-5А/B "Слобода файтер" и Ф-5том/Ф Тигар II део суперсонични лако борац породице прочитајте више "
The Radioplane BTT, known as RP-71 by the company, as WS-426/2 by the United States Navy, and as WS-462/2 by the US Air прочитајте више "
Јак-11-наставно-тренинг авион који се користи ратно ВАЗДУХОПЛОВСТВО СССР-а и других совјетских утицајем ваздушних снага са 1947 прочитајте више "
У Локхид Ф-94 Старфайр је прве генерације млазних авиона ВАЗДУХОПЛОВСТВА САД прочитајте више "